My Girlfriend is a Mermaid!? is the heartwarming visual novel about a protagonist living in the city who decides to return home to his rural hometown. Once there, he finds out his childhood friend Ion (voiced by Fuchigami Mai of Girls und Panzer) has become a mermaid! 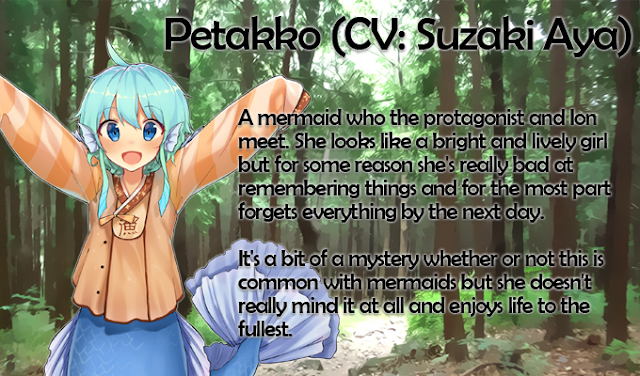 He also meets Petakko (voiced by Suzaki Aya of Assassination Classroom), another mermaid who has lost her memory. 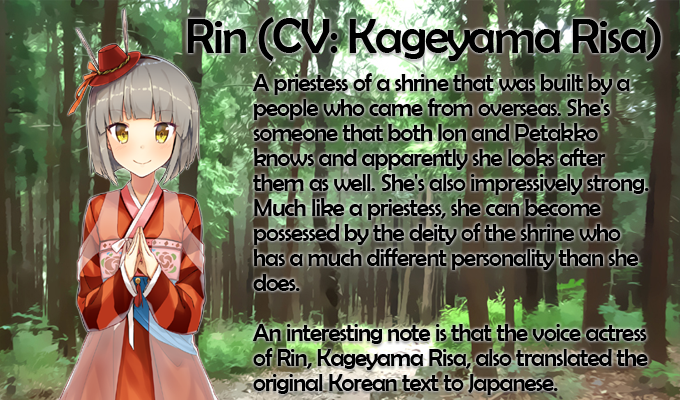 The third heroine the protagonist meets is Rin (voiced by Kageyama Risa of Dead End 99%), a priestess who looks after the mermaids but has a split personality. And so a summer vacation full of mysterious mermaid legends begins! The player can make multiple choices, which lead to a variety of endings. This visual novel is from the Korean developer TALESshop and the Japanese publisher COSEN. It previously came out on GooglePlay and the AppStore, but was only available in Korean and Japanese. Now, Sekai Project are translating the game into English, bringing it to the West in a port to both the PC and Nintendo Switch! 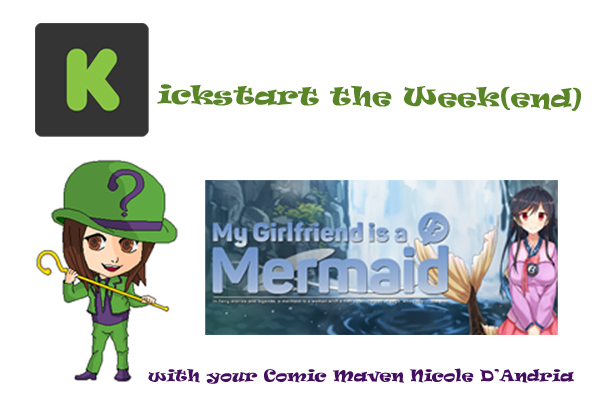 The Kickstarter for My Girlfriend is a Mermaid!? has already reached its $12,000 goal and is currently pushing past $15,000 with the end of the project closing in on June 24, 2018 at 2:57 PM EDT. Rewards include a digital download of the steam game ($10) plus a digital download of the Nintendo Switch game ($15) and the digital soundtrack ($25). To see more rewards, which include an artbook, T-shirt and hug pillow case, check out the Kickstarter here. I spoke with Christopher Ling, the CEO at Sekai Project who worked on the licensing to acquire My Girlfriend is a Mermaid!? Me: For people unfamiliar with Sekai Project, what can you tell us about the company and your role in it? Ling: Sekai Project is a game publishing company based in Los Angeles, CA. We’ve been in the business for five years with a focus on Japanese games, particularly visual novels. In that time, while a great deal of our games come from Japan we also publish titles from all over the world. 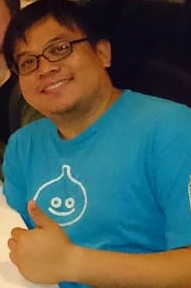 While my role is CEO at Sekai Project, my primary task is licensing work mainly with developers in Japan and Asia as well. I also work with my counterparts at our Tokyo office on licensing acquisitions as well. Me: Why did Sekai Project want to license My Girlfriend is a Mermaid!? in particular? Ling: We originally published another title from the same developer, My Little Kitties, and they decided to go to us again regarding another of their visual novel titles. There was much to like about the designs and premise of My Girlfriend is a Mermaid!? and thus we decided to pick it up as well. Me: In what ways is the content on the PC and the Nintendo Switch different? Ling: In terms of the content in the PC and Nintendo Switch versions of the game, the content is essentially the same. The difference is that the Nintendo Switch version has some additional enhancements such as a new vocal song for the opening and Live2D animation while the PC version is closer to a direct port of the smartphone version of the game. Me: If you had to pick, who is your favorite of the three heroines in the game and why that character? Ling: I’m a bit of a traditionalist when it comes to these things so I’d have to go with Ion. I love her character design and have a special place in my heart for childhood friends. And truthfully, that she tends to whack the protagonist with her fin is worth every moment. Me: How did you decide on the perfect voice actors for each character in the game? Ling: This decision was actually already made by the development studio when the smartphone version was developed. Nevertheless, I think the voice actresses were a fine choice for each of their characters. 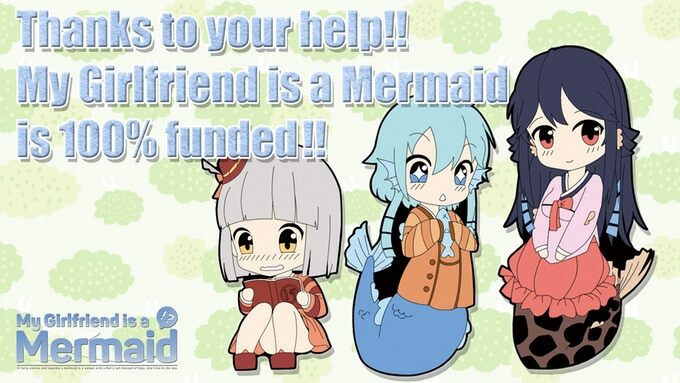 I already enjoy some of the work they’ve been a part of outside of My Girlfriend is a Mermaid!? so I didn’t have any doubts of their abilities. Me: What are your three favorite things about visual novel games that players will be able to enjoy in My Girlfriend is a Mermaid!? Ling: What fans look for in visual novels differs from person to person but for those that like standard comedic romance tropes, they will definitely enjoy this game. You have all the important food groups such as the childhood friend, quirky side characters and a mystery, in this case involving mermaids. Couple that with professional level voice acting, there’s something for everyone. Ling: Honestly, if you are drawn in by the characters in this game, that’s more than enough reason. 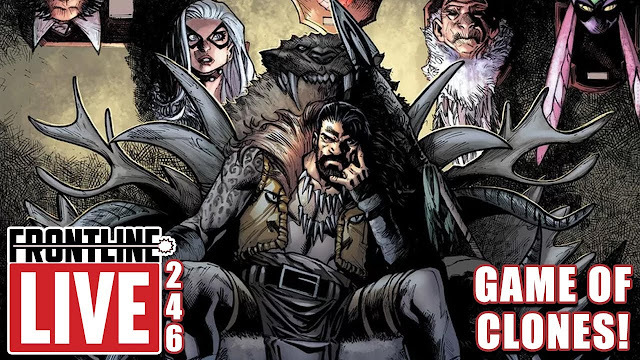 The developers were worried that there wouldn’t be a strong reception for this game but the fact that the Kickstarter goal was met so quickly was a clear sign that there’s interest in this game. Me: What advice do you have for people aspiring to make visual novel games? Ling: With any project, always understand the specific goals and what you want to achieve when it comes to making a visual novel. It’s easy to get deep into the planning of a game and let the scope of the work get blown out of proportion so always go in with a clear mind and reasonable expectations. Me: Thank you for telling us more about the world of visual novels! 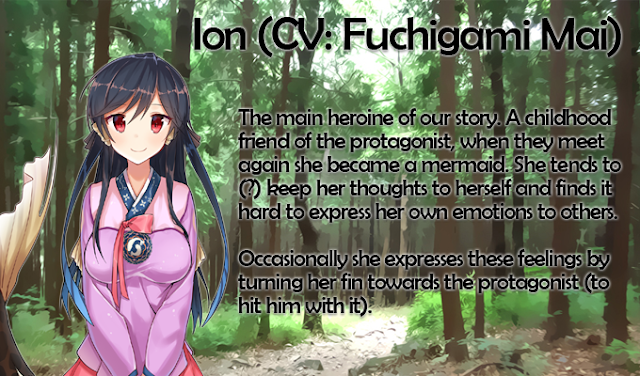 If you’re reading this and interested in a mermaid girlfriend, check out the game My Girlfriend is a Mermaid!? here.